Listen here Freshmen. You're in college now! And with the start of this undoubtably amazing experience comes a lot of responsibility, both in the classroom...and the dorm room. 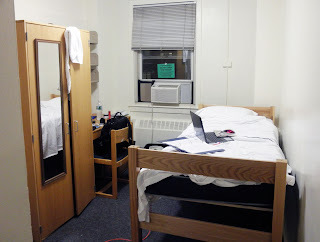 At the start of this Fall semester, make sure that you and your roommate(s) get off to a great start with some of these helpful dorm/ first apartment etiquette tips. This may sound disgustingly obvious. However, lots of incoming freshman forget to show basic courtesies during move-in day. I know this from experience. Maybe they're nervous? I blame texting. Everyone operates differently. Some people are absolutely disgusting slobs, and others are OCD neat freaks, etc etc. No matter the differences, the ultimate goal for you and your roommate is to live in harmony. Talk about your dorm/apartment management preferences. Moreover, be ready to comprise. 3. KEEP THE NOISE DOWN! I'll be honest, there was nothing that annoyed me more than my noisy roommate from sophomore year. Seriously, that guy acted like he never heard of an invention called headphones. To make matters worse, when I broached the subject with him he'd respond by saying something like, "Rob, you're definitely right. I need to get some headphones. Sorry!" Then he'd forget. This tip is most likely for the girls. Simply put, don't take 30 minute+ showers. It's rude, wasteful, expensive, and environmentally unkind. Furthermore, if you choose to hog the bathroom during the morning, you may cause your roommate to be late for class...thus putting you on their bad side. 5. WHEN IN DOUBT CONSULT YOUR RA. Why make a minor dispute into World War III? If there is something that you and your roommate can't agree on, talk to your floor's RA. After all, they are trained and paid to deal with your often petty problems.